First, there was The Grapes of Wrath, then there was Welch’s Grape Juice, now grape seed oil is quickly rising among the ranks of famous things involving grapes. Grape seed oil is easy to find (just step into your local Trader Joe’s) and has a number of benefits that should put it at the top of anyone’s must-have for haircare list! Nutrition and Metabolic Insights points out that grape seed oil is high in fatty acids like omega-6 and omega-9. Phenolic compounds also make up more than half (60 to 70 percent) of grape seed oil’s composition and the oil is also high in polyunsaturated fats (PUFAs) like oleic acid. These polyunsaturated fats, according to KinkyCurlyCoilyMe, ensure that the sebaceous glands are producing enough oil and make hair malleable and less subject to breakage. PUFAs also add shine, which you can never have too much of. 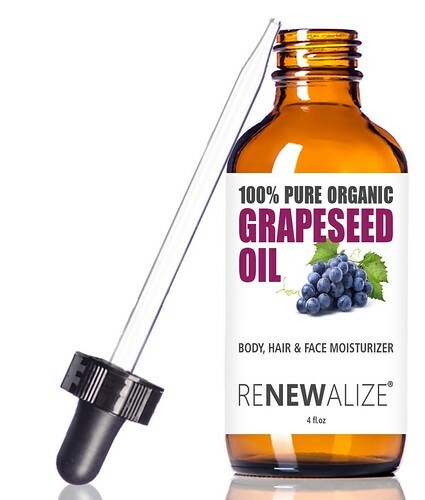 Like many other oils, grapeseed oil contains a high amount of vitamin E.
Research shows that grape seed oil can help with hair growth and even treat alopecia. According to the Journal of Investigative Dermatology, grape seed oil encouraged the development of mice's epithelial cells, which form the surfaces of organs–including skin–, and stimulated hair growth. A similar study, also done on mice in Japan, showed that grape seed oil caused an increase in hair follicle cells. Progressive Health notes that the oil can decrease the amount of DHT in the hair, which can stimulate the scalp. It can also improve circulation all over the body and reverse aging, both of which can motivate increased hair growth. For natural hair aficionados who enjoy the occasional heat style but want anything silicone-based to stay as far away from their tresses as possible, grape seed oil might be the solution. According to Curly Nikki, oils can serve as good protection against heat damage if they have a high tolerance for elevated temperatures, something that can be determined by their smoke point. Grapeseed oil has a smoke point of 485ºF, flat ironing hair requires a temperature of around 300-400ºF. Curly Nikki warns, however that grape seed oil or oils of any kind can slow your flat iron down as it passes over your hair. This causes you to have heat on sections of your hair for longer periods of time and can ultimately create more damage. Grape seed oil also has a lower smoke point than other oils including safflower oil, which can withstand heat up to 510ºF and avocado oil, which goes up to 520ºF. So if you have thicker hair or are heat training your hair, you may want to err on the side of using an oil with a higher smoke point so as not to permanently damage your hair. Healthline notes that while, as a lighter oil, grape seed oil isn’t good as a remedy for dry scalp caused by extreme conditions like eczema and psoriasis, it can be helpful for decreasing frizz. According to Livestrong, you can massage the oil into your scalp, leaving it in over night, coat the hair and use it as a deep conditioner or blend it with another oil like jojoba oil to treat the scalp for hair loss. Grape seed oil is an excellent supplement oil to have in addition to staples like castor and coconut oil. While it may not be the cure-all that other oils have been lauded to be, its unique benefits make it a product that shouldn't be counted out. The next time you need to make a trip to the beauty supply store, grape seed oil should definitely be on your list to add to your hair care cabinet!